Christian Bale and Joel Edgerton star in director Ridley Scott’s biblical epic Exodus: Gods and Kings. Watch it now on Digital HD using your PS3, Xbox, Kindle Fire, iPad, PC and other devices. 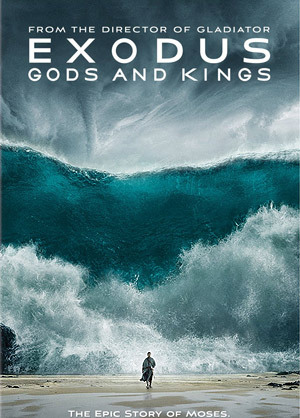 Based on the biblical story, ‘Exodus: Gods and Kings’ chronicles the story of Egyptian Prince, Moses (Bale), who learns of his true heritage as a Hebrew and his divine mission to free his people from Egypt’s Pharoah, Rameses II (Edgerton). MPAA Rating: PG-13 for violence including battle sequences and intense images. From acclaimed director Ridley Scott (Gladiator, Prometheus) comes the epic adventure EXODUS, the story of one man’s daring courage to take on the might of an empire. Using state of the art visual effects and 3D immersion, Scott brings new life to the story of the defiant leader Moses (Christian Bale) as he rises up against the Egyptian Pharoah Ramses (Joel Edgerton), setting 600,000 slaves on a monumental journey of escape from Egypt and its terrifying cycle of deadly plagues.